Dreadnought wide range of ornamental ridges are all handmade and add something special to the roof. The ridges are at 300mm unless stated as 450mm. 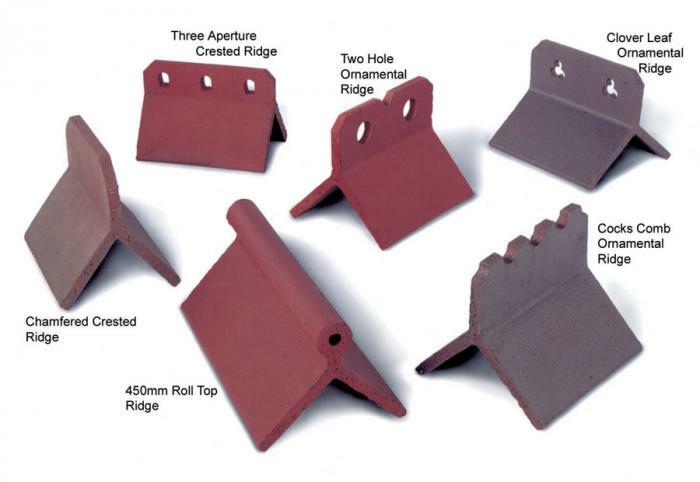 The New British Standard BS 5534 requires all ridge tiles to be mechanically fixed. The tileline ridgeroll system will allow for mechanical fixing of ornamental ridge tiles whilst providing ventilation in the roof (click here for more info). 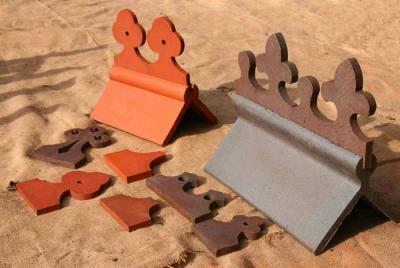 A more traditional mortared look can also be achieved by bedding the ridge tiles in the normal way but using a clip and screw between the ridge tiles to create a mechanical fixing before the mortar "goes off", but this method does not provide any insulation (though this can be provided elsewhere on the roof with tile vents). In addition to the ornamental ridges shown above, we also manufacture bespoke ridges and we can match existing designs for restoration projects. These slotted roll top ornamental ridges pictured have a groove in their length to take specially made inserts. These inserts are fixed into the groove in the roll using an epoxy resin. Any shape of insert can be manufactured and here you can see some examples of various shapes we have made.